To track your order, please enter the Last Name from the Shipping Address, your Order Number, and the Zip Code form the Shipping Address, then click the "track" button. A window will pop-up with the current status of your order. Please note that this tool will ONLY work with orders placed on the Mr. Heater or Heatstar websites or most of the orders placed with of our Service Technicians over the phone. 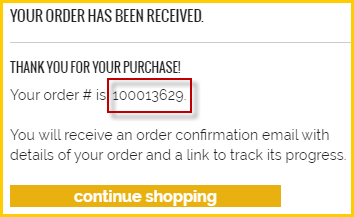 The order number must be a 9 digit number with no letters, spaces, or punctuation (i.e. 100001234). If you placed an order with one of our Service Technicians and your order starts with "SO" then you will need to contact Customer or Technical Service for more details. If you placed an order with a retailer who carries our product, you will need to contact them to track your order. We are sorry for any inconvenience. Below is an example of the order number format required to utilize the Tracking Tool which will appear as soon as you place the order and should also be in your email confirmation.